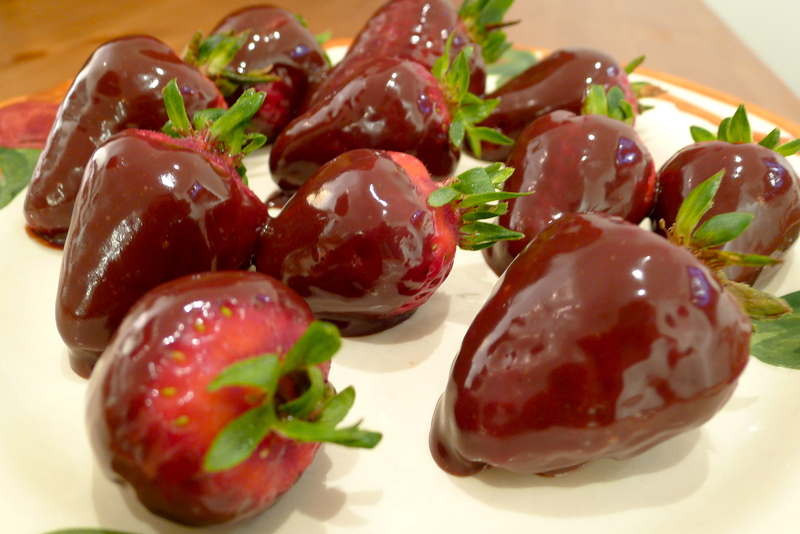 Chocolate-covered strawberries get a bad rap. It’s perhaps not so surprising: the majority of ones in this country are sold in February, when strawberries are completely out-of-season. Now I have nothing against partaking in enrobed fruit for Valentine’s Day, but strawberries bought in the middle of winter are usually shipped from South America, freakishly oversized, and stunningly tasteless despite their glossy red exteriors. The chocolate sarcophagus they come in isn’t always very appetizing either. But it is finally springtime — officially the start of strawberry season. Now is the time to see that chocolate-covered strawberries done right can be a sinfully sloppy mess. How can you tell if a strawberry is ripe? Smell it. Does it smell like a strawberry? No? Put it down. Walk away. Yes? Is it a full-on, luscious, musky strawberry-smell? Buy. Now. Buy buckets of them. This sauce is fantastic. So easy and so versatile. Dredge fruit in it, or even better, drizzle warm gobs of it over vanilla-bean gelato. Or just eat it out of the pot. It’s fabulous. 1. Cook the sugar in a small dry saucepan over moderately high heat, undisturbed, until it begins to melt, about 2 minutes. Continue to cook, tipping the pan from one side to the other, until the sugar has melted into a deep golden caramel, about 1 to 2 minutes. To help visualize this, here is a handy profanity-free video with Gordon Ramsay. 2. Remove the caramel from the heat and carefully pour in the cream. The cream will steam and bubble vigorously. Once the bubbles begin to subside, return pan to moderately low heat and cook, stirring or whisking constantly, until the caramel has dissolved. If the caramel does not seem to dissolve completely, add 1 to 2 teaspoons of water at a time, stirring, until it has dissolved. 3. Turn off the heat and continue to stir or whisk the caramel to cool it down a little bit. Add the chocolate and the salt. Stir or whisk the chocolate into the caramel. The sauce should be thick and glossy when you are finished. 4. Dip the strawberries in the sauce and arrange them on a plate. Serve them to someone you want to make happy.